Regardless of what business you own or operate, components such as your elevators serve to provide safe, convenient transportation for all employees and guests. Modern units are built to run reliably day-in and day-out, but what happens when your system begins to age and break down? Unsightly appearances, strange sounds, and unexplained vibrations can all impact the experience for your workers and customers, making it important for you to take the proper precautions to ensure that riders are comfortable with their surroundings. Kohtler Elevators is here to provide high-quality elevator parts such as: the doors, cabs, and entrances to deliver lasting results across many industries. We understand the importance of a clean, smooth elevator system, and will work hard to ensure that your building is outfitted with the best. 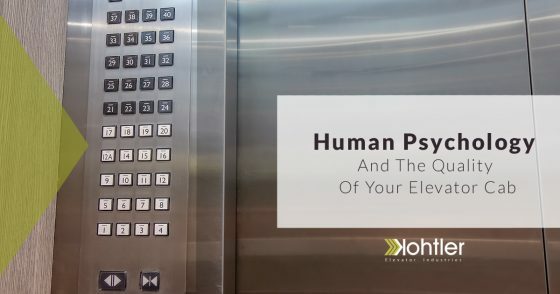 Today, we’ll discuss the relationship between your psychology and the comfort of your elevator cab. If you’re here looking for quality elevator parts, be sure to check out our products before contacting us today! Instincts — Just as we have evolved to fear cliffs and packs of wolves, the human brain has developed a serious problem with being confined in a small space. Elevators are small and enclosed, activating this fight or flight response. Learned fears — Everyone has heard of the story of the individual caught in an elevator for 20 hours, right? Previous experiences and shared stories can all play a role in an individual’s comfort levels. Riding in an elevator can be a fearful experience for many people. As you ascend or descend to your destination, numerous cables, pulleys, and other equipment will spring into action, often with little disturbance to the elevator cab’s interior. Shafts that produce loud noises, including bangs, crashes, and thuds — can quickly ruin the quality of your elevator ride. Annual maintenance helps to minimize these disturbances, but aging systems may be at risk for continuing l audible problems. Elevator music can also play a large part in keeping commuters calm when the doors close. This audio is designed to be pleasant, uplifting, and help to keep your mind off of the machinery operating around you. For over 100 years, elevators have benefitted from the calming and entertaining effects of music. Otherwise, you’d be left listening to the elevator’s passage. By minimizing unpleasant stimuli, you can create a smooth, quiet ride for everyone! Throughout a normal day, you likely process millions of bits of information, all working to deliver a complete message to the brain. When your passengers stumble into an elevator cab interior that is drab and worse for the wear, the chances are much higher that they will feel uncomfortable using the machine. The appearance of your building is an embodiment of how you do business, and should therefore match your commitment to quality. Clean, polished elevator entrances and interiors can do much to instill confidence in the users. Even minor aesthetic details can play a role in determining how comfortable your elevators are. Bear in mind that this experience will likely play a role in the overall impression guests get about your business. Companies in need of fresh styles and new elevator parts can benefit from speaking with Kohtler Elevators for assistance! Other features in your elevator cab can help to keep passengers entertained during longer trips. Buildings that have installed elements such as mirrors, notice a direct drop in user complaints, as people love distractions. The movement of the elevator from one floor to the next may not be perfectly smooth, and that is fine. Some commercial elevator owners may notice jolts, jars, and a variety of other alarming movements during operation that can vary in intensity. The comfort of any elevator ride can be interrupted by these movements. Even minor shifts when starting or stopping your elevator cab can cause concern. These sudden movements and vibrations may be minor, yet the impression left of on guests can suggest otherwise. Kohtler Elevators is here to deliver top-notch elevator parts and services for all of our customers. We understand the deep connection between quality and comfort, and work hard to deliver the best results for all of our customers. Your guests will see the quality of your building and unconsciously assess the odds of your elevator breaking down. Better appearances can do much to mitigate concern, as individuals often feel better when using superior products or services. If you are a property manager looking for quality elevator parts to outfit your system with long-lasting beauty and strength, be sure to contact our team for assistance!